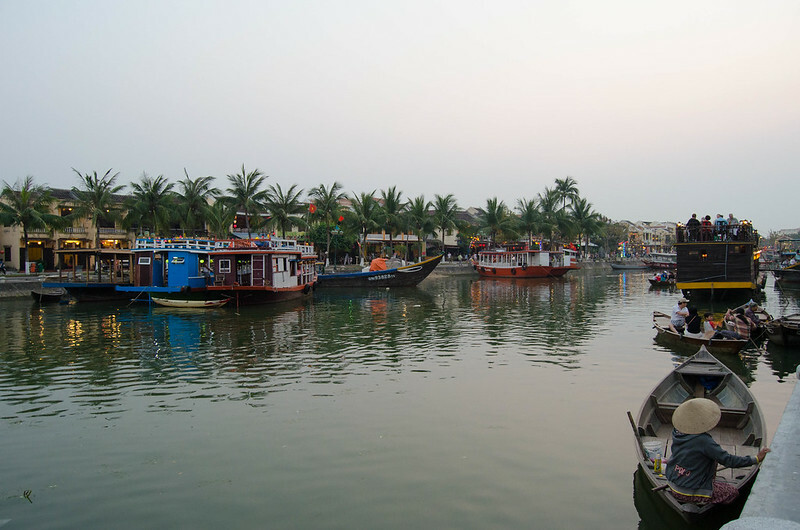 We arrived in Hoi An at dawn to a city still half-asleep. In the half hour walk to our accommodation, we saw many paper lanterns hanging from tree tops and cables: “we’re definitely in Hoi An”. When we got there the doors were still closed, so we decided to sit and wait by a water stream nearby. Our backpacks probably caught the attention of a random lady who approached us asking if we needed a place to sleep. We politely declined the offer saying we already had a reservation, so she left for a few moments just to come back on a scooter to make the same offer ̶ that we declined once more. Maybe she thought we wouldn’t recognize her with a helmet on. Minutes later she started waving at us from her house, to let us know that her house was right there, on the other side of the stream. Feeling awkward, we left and went for a coffee. 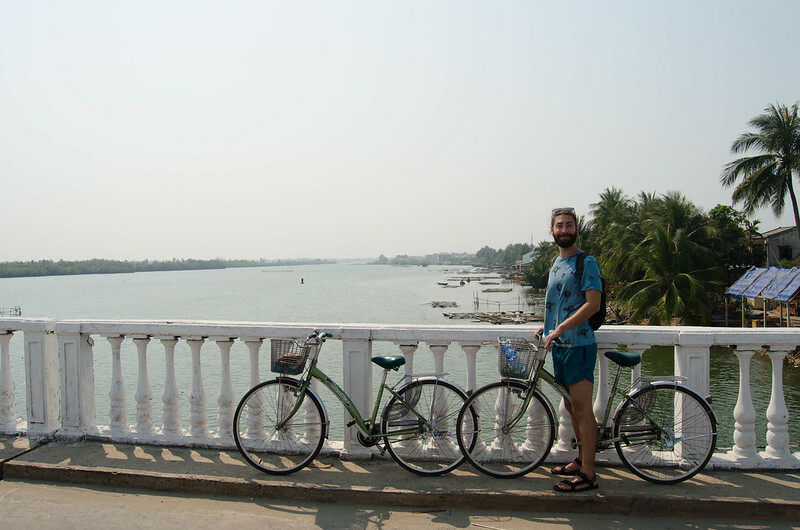 We rented two bicycles from our accommodation to visit Hoi An old town. In 10 minutes we arrived at the entrance, left the bikes away from the bike park assistants and headed to Chua Phap Bao Pagoda. 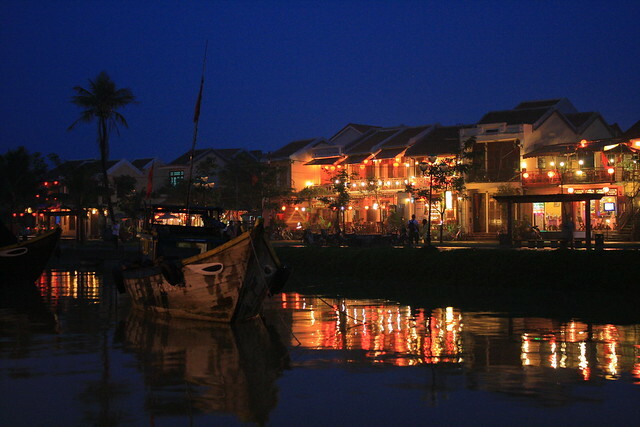 Hoi An was a far Eastern trading-port from the 15th to the 19th century. 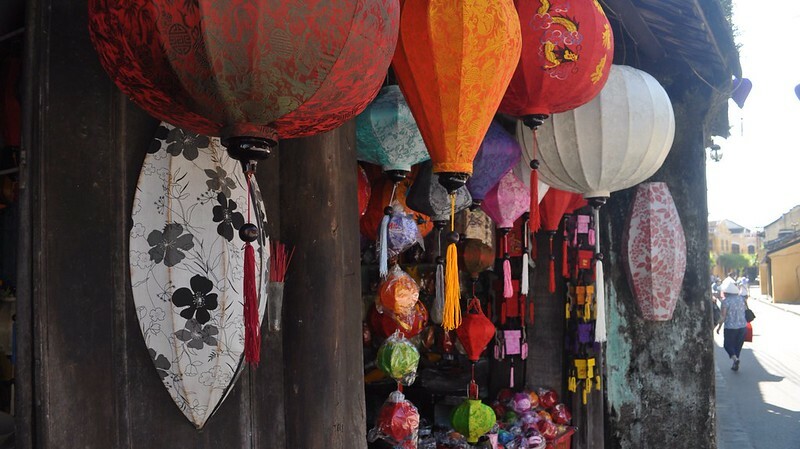 The town is a complex of narrow pedestrian streets colored by bright yellow houses, temples and paper lanterns. Being the UNESCO World Heritage Site that it is, the streets are overflowing with tourists and unfortunately, a big part of these traditional buildings were transformed into souvenirs shops. The original street plans and townscape remained intact, but you’ll find many houses serving as coffee shops, tailors, photography shops, knick-knacks shops and restaurants. Restaurants here can get a bit pricey, but you’ll find some food stalls away from the main streets. We ate a very decent bowl of cau lao: noodles on some sort of herbal broth with dough fritters and roast pork on the top, at a fraction of the price of the fancy restaurants nearby. 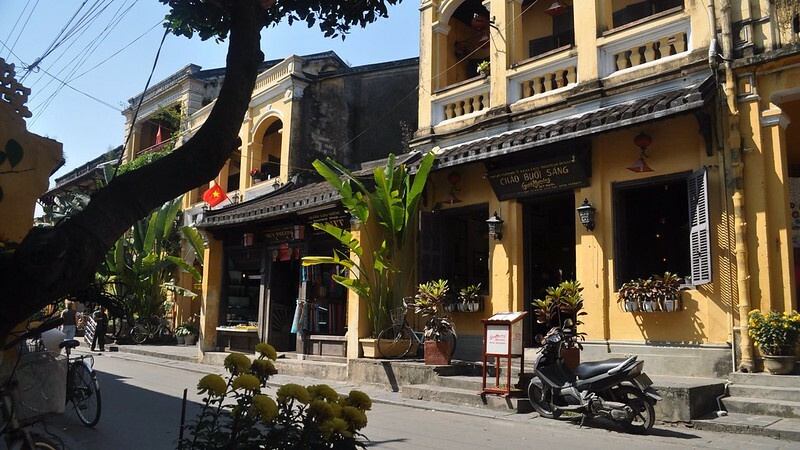 To visit the historic center of Hoi An you’ll have to buy a ticket at the Tourist Information Center: we paid 4.74€ each. The ticket comes with a map of the area highlighting some temples and houses, allowing you to enter 5 different attractions within the historical center in 24 hours. After the first 5, you’ll have to pay for every individual place you decide to visit next. In total there are 22 points of interest listed. We managed to visit more than 5 without paying any extras, so you might get lucky as well. It’s a bit hard to define the opening hours of all the places, but we can say that most of them close around 5.30PM, and some close for lunch. 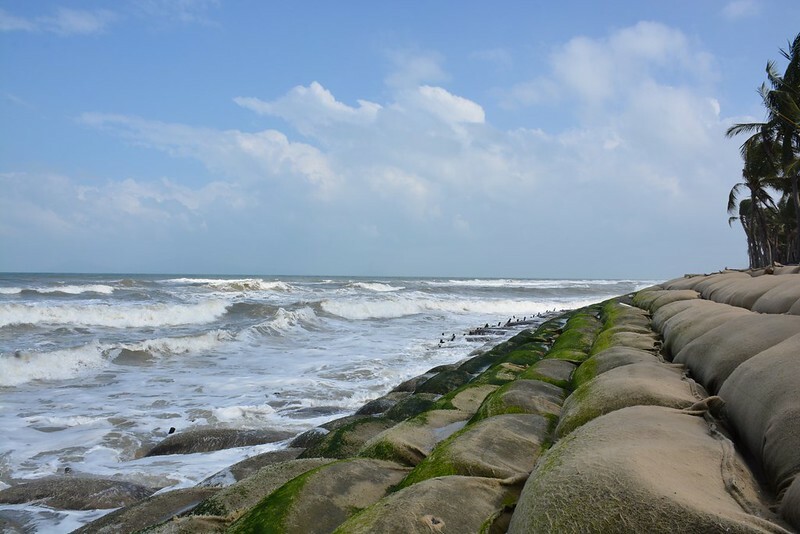 The first one we visited was: Quan Thang. You can skip this one, it’s not worth wasting an entrance because all you’re allowed to see is a dark hall. We continued to stroll the streets and visited the beautiful Cantonese Assembly. Afterward, we went to the Tran Family Chapel and the Tan Ky House (over 200 years old), both with a small guided tour explaining the history and architecture of the houses, concluding on a room turned in to a gift shop. All these traditional timber-frame houses have a mix of Indigenous, Chinese, Japanese and French influences, and have been passed on to family descendants. We zigzagged through tourist crossing the famous 18th century Japanese Covered Bridge, it was a bit crowded to say the least. If you just want to cross it, you won’t need to show your ticket unless you want to visit the adjacent pagoda. 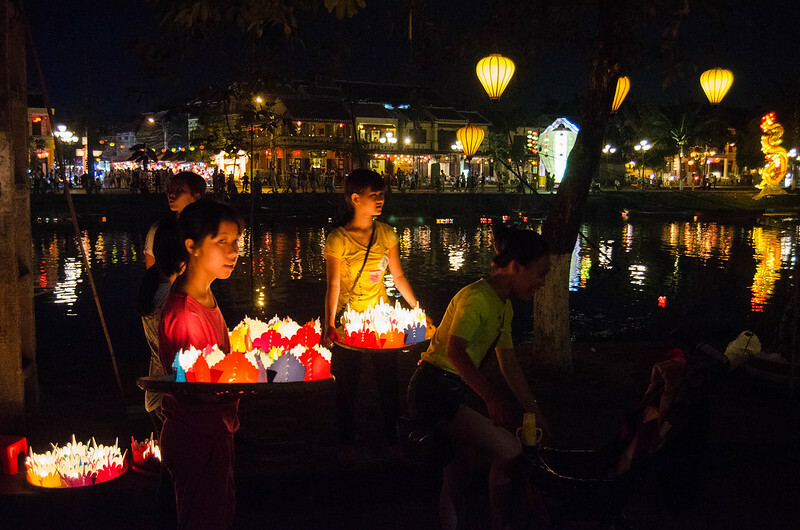 • Full Moon Lantern Festival: there are 13 festivals in 2017, check the calendar here. 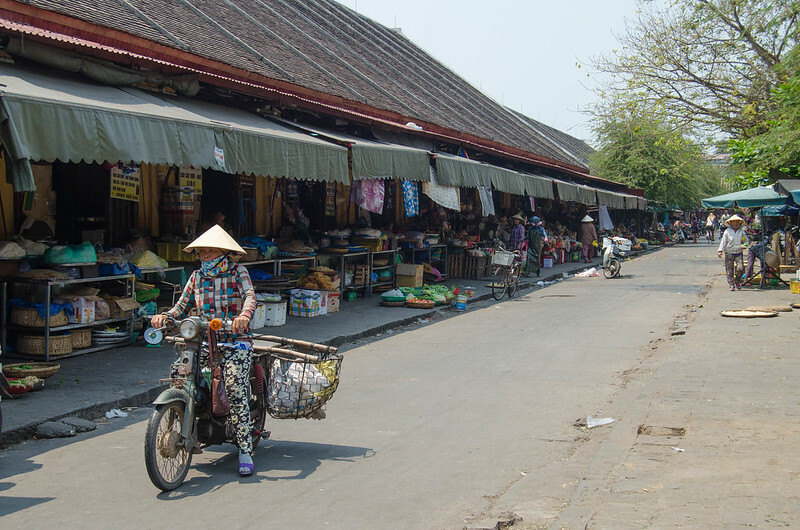 In the late afternoon, we walked towards the local market. While checking some fruits, Mario was approached by a sweet talking girl, that allied to his inability to say “no”, managed to drag him to a tailoring stall to sell him a suit. It took him 20 minutes to get out of there, mainly because she didn’t take “no” for an answer and had a solution for every excuse possible ̶ including international shipping. It reminded us of pushy Bangkok tailors, shamelessly touting to every tourist passing by. The historic center is divided by the Thu Bon River. Here, locals in their small wooden boats, invite you in as soon as you approach the promenade. At night time the river gets lit up by floating paper lanterns sold by young girls all around the riverbank. In the streets hundreds of lanterns create a magical atmosphere, inviting everyone for a night stroll. 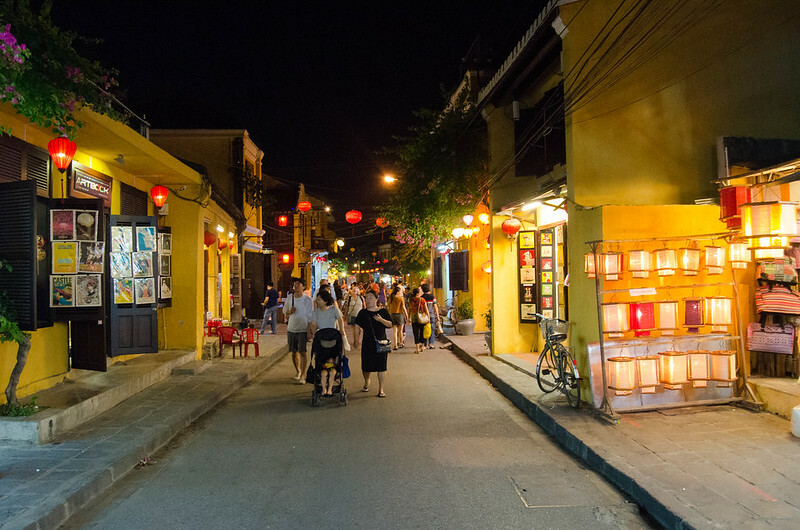 You must walk around Hoi An old town at night, there’s plenty to do and to see. On the morning of our second day, instead of pedaling towards the historic center, we headed towards the ocean. In the middle of the bike ride that took around 50 minutes, we stopped at a cafe and ended up talking with the owner. The conversation flowed and eventually, we reached the topic of global warming and the rise of sea levels. 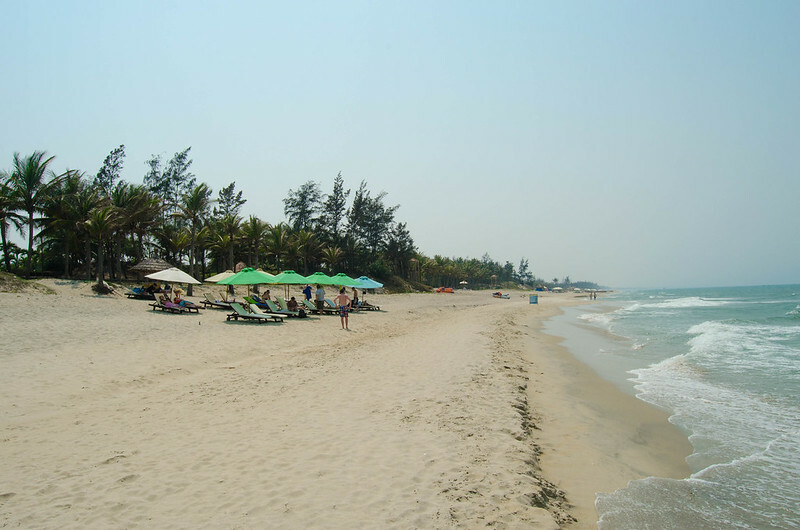 The owner of the cafe ̶ a very sweet Vietnamese lady who had never traveled abroad ̶ talked about her childhood on Cua Dai beach that is now partially destroyed. She was a bit surprised to hear that this is a global problem when we told her that the same is happening on the Portuguese coast. 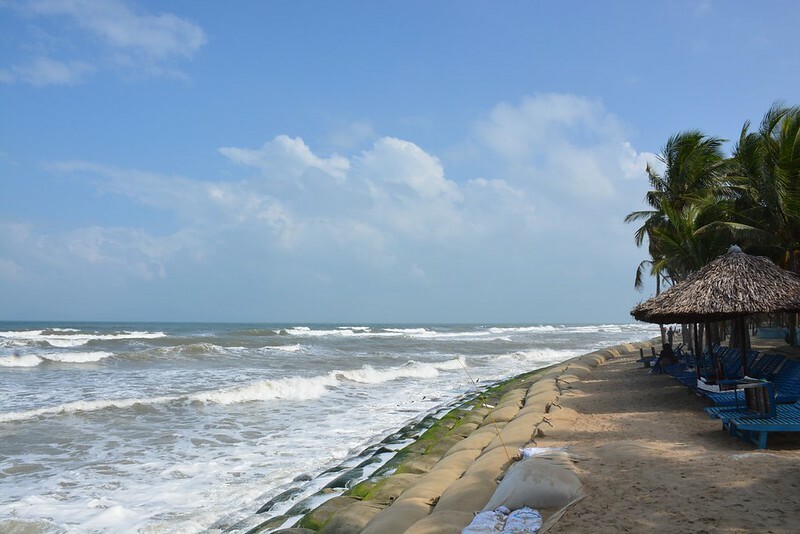 Later on, when we arrived at Cua Dai beach, a big portion of the shore was made of sandbags stacked together to contain the sea. 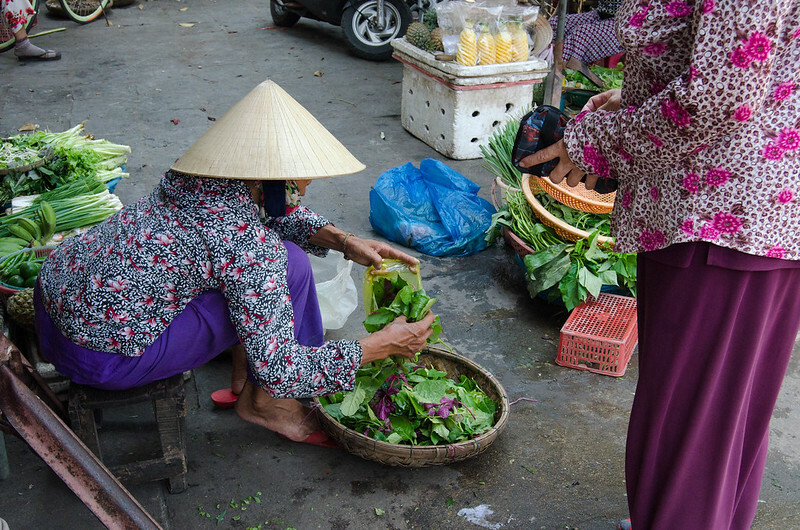 We spent two days in Hoi An which were enough to feel the area and visit the picturesque historical center. 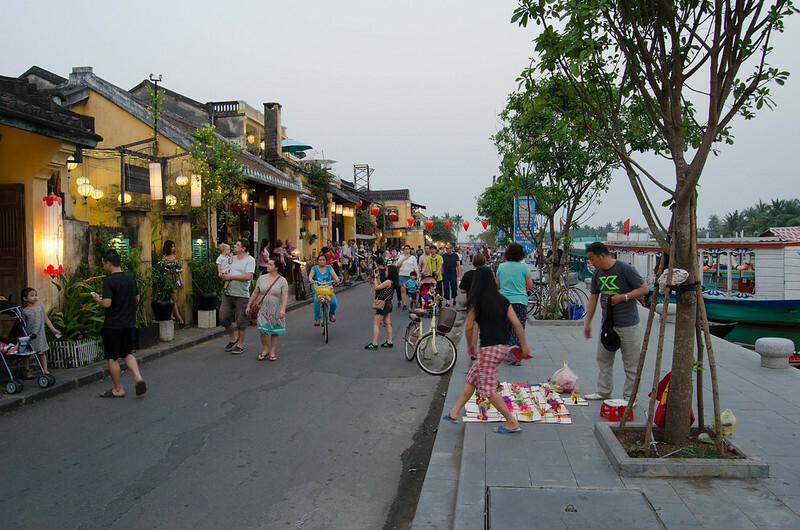 Despite the many tourists, Hoi An managed to convey a really intimate and magical atmosphere. Things tend to be a bit more expensive around here: accommodation, bike rental, and food. Luckily we booked a room with a fridge and ate tons of fruit from the local market (best watermelon ever). If you have any questions or some extra info to share, please leave it in the comments below! Thanks for stopping by.